Nitrogen is an important and expensive input for corn production, with fertilizer expenses including nitrogen comprising 37 to 45 percent of annual total operating expenses for corn in the United States between 2010 and 2016. 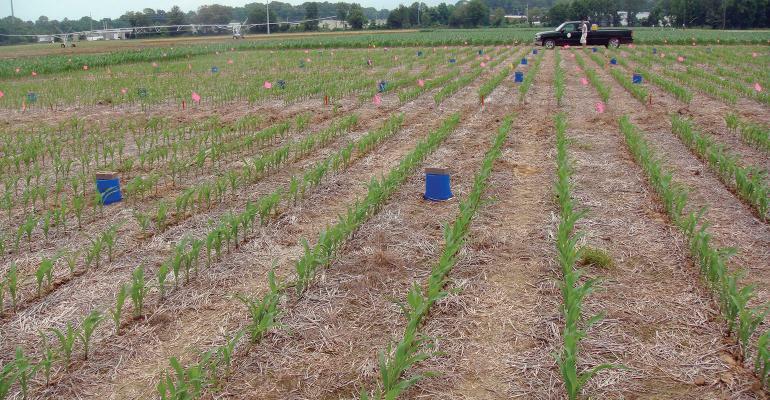 Researchers at the University of Tennessee Institute of Agriculture studied the effects of replacing ammonium nitrate fertilizer with enhanced efficiency (EE) urea fertilizers on no-till corn yields and net returns in Tennessee. This study is timely, as increasing security concerns regarding ammonium nitrate have led to more government regulation, increased prices, and reduced availability of the product. Tennessee no-till corn producers were directly affected by the changes, as the state was the second-leading user of ammonium nitrate in the U.S. in 2011. In 2016, harvested corn for grain in Tennessee covered 830,000 acres, and approximately 75 percent of that acreage was planted using no-till. Although urea is a less-expensive, widely available nitrogen fertilizer alternative, considerable amounts of nitrogen can be lost through ammonia volatilization — the amount of nitrogen lost to the air — when broadcast on the soil surface in no-till crop production.